Narayan Gopal Guruacharya (Nepali: नारायण गोपाल गुरूवाचार्य ) (October 4, 1939 - December 5, 1990) is the most prominent and popular singer and composer in the history of Nepali music. He is popularly referred to as "Swar Samrat"
Narayan Gopal Guruacharya (Nepali: नारायण गोपाल गुरूवाचार्य ) (October 4, 1939 - December 5, 1990) is the most prominent and popular singer and composer in the history of Nepali music. He is popularly referred to as "Swar Samrat" (Nepali: स्वर सम्राट, meaning: Emperor of Voice) in Nepali music. He is also known as "Tragedy King." He is well known as a singer as well as a composer. His voice range allowed him to sing songs of every genre of Nepali music. His songs are often richly orchestrated with the sitar, harmonium and flute. He belongs to the first generation of Nepali singers who took singing as a profession. His songs have also been used in movies and dramas. Narayan Gopal has been accorded with title “Swor Samrat” (literally, King of Voice) which affirms his position as the supreme virtuoso of Nepali music. His death was due to organ failures, said to have been caused by his notorious drinking. The cassettes and CDs of his music still make significant sales in Nepal. He has sung over 500 songs, including in films, ballets and drama. Most of his songs are melodies. It is said that he was very selective about which songs he sang. Although 500 songs is not a lot for some of his caliber, they are outstanding in some ways—be it the lyrical depth or superb rendition. In recognition of his contribution in the field of Nepali songs, he has received several national honors and awards, Trishakti Patta, Chinnalata Puraskar to name a few. Continued sales of his albums attest to his immense popularity. Even more than a decade after his death, his songs are equally liked, loved and sung. His legacy lives on. 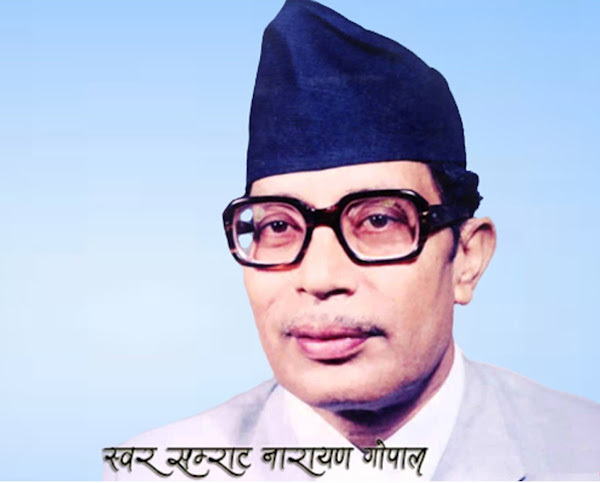 Current sensation, Ram Krishna Dhakal, a very popular singer, sang Narayan Gopal’s songs and modeled his singing style after him when starting his career. “The late Narayan Gopal (1996-2046 BS) is regarded as the most popular in the entire domain of modern Nepali music. A still more appropriate introduction of the music maestro would be to call him the King of Vocals or Swar Samrat of contemporary Nepali music. Narayan Gopal, who has enchanted millions of listeners by his immortal melodies has been awarded several national honors among which, Indra Rajya Laxmi Award, Chhinalata Award for vocals, Jagadamba Shree, Trishakti Patta third (awarded post humously) Urvashi Rang and several other honors and decorations bear testimony to his widespread popularity and the eminence he has achieved as a favorite singer of millions. Narayan Gopal was born to a Newar family in Kathmandu in 1996 Bikram Sambat (BS). His father was a classical musician and wanted his son to follow his footsteps. Narayan Gopal was interested in music from an early age but not exactly into classical field. He studied music in India. The late Gopal Yonjon and Narayan Gopal were good friends and “mits”. (It’s a nepali custom where good friends enter into a kind of a lasting friendship. This is generally seen as strengthening the friendship bond.) Narayan Gopal has sung many beautiful and soulful songs composed by Gopal Yonjon. List of Songs of "Narayan Gopal"